You’ve probably seen it happen. You’re driving your car and you come to a stop at the traffic lights. You’re mindful of traffic infringement fines and public safety, then someone on a bike rides past you, unconcerned, straight through the red lights. Riding through red lights is arguably the most hated cyclist behaviour – but why does it happen? Are cyclists just recalcitrant law breakers? Is the answer to fine every cyclist who rides through every red light? Or is there a bigger picture? When you are riding do you stop at red lights? The majority (63%) said yes, while over a third (37%) said they had ridden through a red light at some time when they were riding. What follows are the main reasons given by those who had ridden through a red light. Turning left against the red light was the most common reason cyclists gave for infringement (32%), with safety and continued travel cited as the main motivations. Some respondents considered it was safer to turn left against the red than to wait for the green light. Going through meant they would clear the intersection ahead of turning motorised vehicle traffic, considered safer than negotiating the turn with cars. There was a perception that there was little risk from the crossing vehicle traffic as cyclist ride close to the curb and do not enter the line of traffic. Continued travel was also a benefit of this infringement type with some respondents treating some intersections as a yield, or give-way. Indeed at some locations in Australia (the image on the left was taken in Canberra) and internationally, all road users are permitted to turn left on a red signal at some intersections. Road users must come to a complete stop, give way to pedestrians and turn any time when it is safe to do so. In some states in the US, with right-side travel, right turn on red is legal at most intersections. In the UK, the idea of allowing cyclists to turn left on red was suggested in 2010 to address an increase in cyclist-truck conflicts at intersections. Almost a quarter of respondents (24.2%) reported they infringed because they were unable to change the red light to green, as the inductive loop embedded in ashphalt did not detect their bike. The way the respondents described this scenario followed a similar pattern. On previous trips they had ridden to the intersection and there were no vehicles present. Despite riding over different sections of road, or waiting for long periods, they were unable to activate the signal change. On subsequent trips – based on that experience – the respondent would ride through the red light. This typically occurred when riders were travelling early in the morning or later in the evening; but at some intersections, cyclists experienced this at at any time of the day. This justification has been somewhat controversial in some Australian jurisdictions, with road authorities adamant that all cyclists can activate a signal change at all locations. While this may be true, this has not been the experience for some cyclists who currently do not know the exact location they need to ride over to activate the signal change. One simple and cost-effective solution is to clearly mark the location on the road that cyclists need to ride over to be detected by the sensor. A combination of bike symbol and a line of diamond shapes is already on the road at some intersections in Australia. For the effort of a stencil and a bucket of paint, this solution enables cyclists to actively engage in the road network and affirms to the community that road authorities recognise the legitimacy of cyclists as road users. Alternatively, it may be that, in fact, some locations do not detect bicycles. If this is the case, work needs to be undertaken, as it is clearly a gap in the road system. 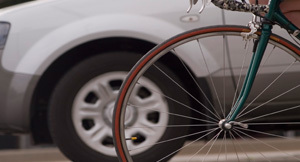 Removing this blind-spot on the roads, where cyclists are invisible to the signalling system, may result in fewer cyclists riding through red lights. This reason is related to the previous one: without vehicles, cyclists couldn’t change the light to green (so again, a stencil and paint could provide the solution). But this one is also related to behavioural norms. The presence of other road users – whether cyclists or drivers – can have a deterrent effect on the likelihood of infringement. Simply put, some cyclists are more likely to break the law if no-one is watching. One in ten respondents had infringed at a pedestrian crossing (10.7%). This behaviour was seen as carrying little risk as the rider continues to travel straight and there is no interaction with other vehicles. But for pedestrians there can be fatal consequences, as evidenced by the death of Mr James Gould who was struck by a cyclist riding in a bunch that had ridden through a red light at a pedestrian crossing on Melbourne’s Beach Road in 2006. In addition, some cyclists infringed when they were riding across the pedestrian crossing, as they would cross as a pedestrian, effectively jay-cycling. Interestingly, an individual’s previous behaviour was also related to infringement. Respondents who had been fined for driving through a red light had 1.5-times higher odds of infringement when cycling, compared to those who had not been fined when driving. For some people, it seems, going through a red light is acceptable behaviour whether they are on two wheels or four. The current education campaign by the Amy Gillett Foundation, Ride Right – Ride Rules, focuses on cyclist behaviour, and the first rule is Stop on Red. Increased red light compliance is likely to improve cyclists’ image, and the attitudes some road users hold towards cyclists. But this is just part of the answer. There are gaps in our road network and perhaps we need to begin to consider the safety benefits for road users in relation to their characteristics, rather than blanketing everyone with the same rules as car drivers. It may be it’s safer for everyone if cyclists turned left at some intersections during the red light phase, and a trial of this could provide insights. Adding symbols to indicate where cyclists need to ride to activate lights is a necessary and positive step to creating a road system that’s cyclist-inclusive.